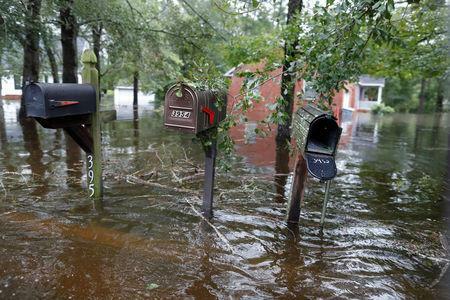 WILSON/WILMINGTON, N.C. (Reuters) - Deadly storm Florence drenched North Carolina with yet more downpours on Sunday, cutting off the city of Wilmington, damaging tens of thousands of homes and threatening worse flooding as rivers fill to bursting point. The death toll rose to at least 14 from Florence, which crashed into the state as a hurricane on Friday, bringing record rainfall. It had weakened to a tropical depression by Sunday, but was forecast to drop another 5 to 10 inches (13 to 25 cm) of rain in North Carolina, bringing rainfall totals in some inland areas to 15 to 20 inches and over 30 inches (76 cm) closer to the coast, according to the National Hurricane Center. "The storm has never been more dangerous than it is now," North Carolina's emergency management office said on Twitter, quoting Governor Roy Cooper. "Many rivers are still rising, and are not expected to crest until later today or tomorrow." 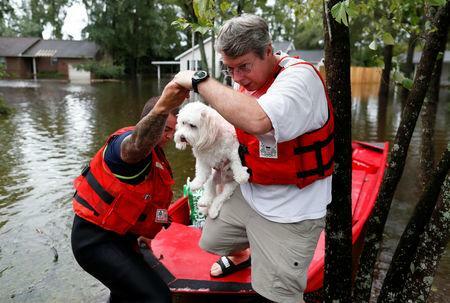 More than 900 people were rescued from rising flood waters and 15,000 remained in shelters in the state, Cooper told a news conference on Sunday. At least 10 people have died so far in the storm in North Carolina, including a mother and child killed by a falling tree, state officials said. Four people died in South Carolina, including a woman whose car hit a fallen tree. People who evacuated were eager to return home but officials urged them to stay away. "Our roads are flooded, there is no access into Wilmington," New Hanover County Commission chairman Woody White told a news conference. "We want you home but you can't come yet." Fresh evacuations were ordered further inland as rivers crested and spilled out of their banks. 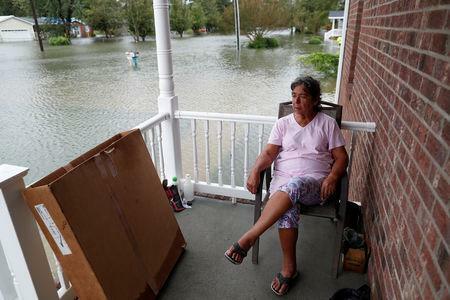 In Fayetteville, a North Carolina city of about 210,000 people some 90 miles (145 km) from the ocean, authorities told thousands of residents near the Cape Fear River and Little River to get out of their homes by Sunday afternoon because of the flood risk. "The worst is yet to come," Mayor Mitch Colvin told a news conference on Saturday. "Right now, we are thinking that there will tens of thousands of homes that are going to be damaged,” he said. In Leland, a low-lying city north of Wilmington, homes and local businesses were engulfed by water. Gas stations were abandoned, with many pumps keeled over, and fallen trees cluttered many roads, making them impassable. The whir of generators could be heard throughout the city, a sound not expected to dim soon as crews work to restore power. About 756,000 homes and businesses were without power in North and South Carolina and surrounding states, down from a peak of nearly 1 million. In Belville, just south of Leland, some shops had power restored on Sunday. North Carolina officials warned motorists not to drive on roads in a large area - south of the I-64 and east of the I-73/74 highways - because of hazardous conditions in the southeast of the state. Swelling rivers and creeks threatened dams and bridges. The flooding could taint waterways with murky coal ash. But so far officials said the state's many lagoons of toxic hog waste had withstood the storm. By Sunday morning Florence's winds had dropped to about 35 miles per hour (55 km per hour), the National Hurricane Center in Miami said. The storm was moving at 10 mph (16 kph), with its center expected to cross the western Carolinas during Sunday and the Ohio Valley and Northeast United States on Monday and Tuesday. The White House said President Donald Trump approved making federal funding available in some affected counties. Trump, who plans to visit the region this week, tweeted his condolences to the families and friends of those who died. As the United States dealt with Florence, a super typhoon made landfall in China's Guangdong on Sunday after barreling past Hong Kong and Macau and killing dozens of people in the Philippines.